PHILIPPINES – The Philippines and Japan signed two loan deals that aims to improve flood control in Manila and build a three-way commuter rail system. 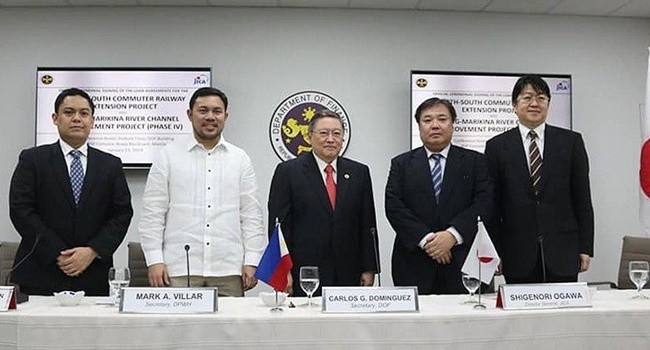 According to PhilStar, the Department of Finance (DOF) Secretary Carlos Dominguez III, along with Japan International Cooperation Agency (JICA) director-general Shigenori Ogawa signed the ₱80.4 billion loan agreement, which means the first portion of Japan’s total commitment in providing funding support for the North-South Commuter Railway (NSCR) Extension Project. The said loan deal carries an interest rate of 0.1 percent yearly for non-consulting services and 0.01 percent yearly for consulting services. The loan is reported to be repayable within 40 years, which is inclusive of a 12-year grace period. As per the report, Dominguez and Ogawa further ₱18.22 billion loan deal for phase four of the Pasig-Marikina River Channel Improvement Project. The loan for the flood control also carries the same concessional lending terms given for the NSCR Railway project. The NSCR Extension will form a part of the 147-kilometer long NSCR System of the Philippine National Railways. This is, by far, the biggest combined project to be shouldered under President Rodrigo Duterte’s “Build, Build, Build” program with a total cost of ₱628.42 billion. The Phase 4 of the flood control project, on the other hand involves the implementation of channel improvement works along the stretch of the Upper Marikina River—from the Manggahan Floodway to the Marikina Bridge. It also covers the construction of the Marikina Control Gate Structure plus two floodgates in Cainta and Taytay, Rizal, thus, making good use of Japan’s disaster prevention technology.